As part of Wessex Scene’s coverage of Women in Sports week, we will be bringing you an exclusive interview each day from just a few of the many talented women we have competing in a wide range of sports here at Southampton. It’s the final day of Women in Sport week here in Southampton. But luckily for you, we have one last fascinating interview with skydiver, Cara Pritchard. Shes jumped all around the world, winning medals where she goes! What inspired you to take up skydiving? While I was in school, I wanted to do some crazy things to raise money for charity. It started as an abseil down the Marquis of Anglesey’s column, but I wanted to go bigger, so obviously that meant skydiving! 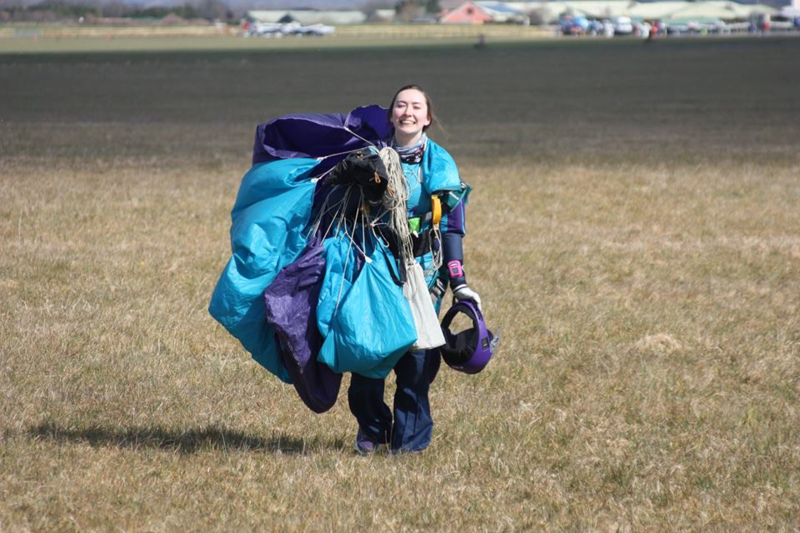 In sixth form, I did a tandem skydive which I absolutely loved. I told the instructor that I had to do it again and again, and he suggested I sign up to the skydive club in university, so I did, and have never looked back. Skydiving is such a small and tightknit community with so many people to look up to. Loads of names come to mind for completely different reasons, so I’ll just mention a few here: Dan Brodsky-Chenfeld is a complete inspiration (look him up, you won’t regret it! ), the reputable Sian and Milko are so genuine, kind, and talented formation skydivers, and Jack Bradford took a hobby he loved and turned it into his career with XDream Skydiving. Skydivers are part of a family and everyone is able to make their mark on the sport in their own way. The weather. Skydiving in the UK can be quite a challenge, especially during winter. We have to be careful of clouds, wind, and other elements, so skydivers spend a lot of time on the ground drinking tea (which is quite pleasant, to be fair). I have also had a couple of skydiving injuries that took some time to recover from, but I’ve learnt from my mistakes and plan not to have any more injuries any time soon! 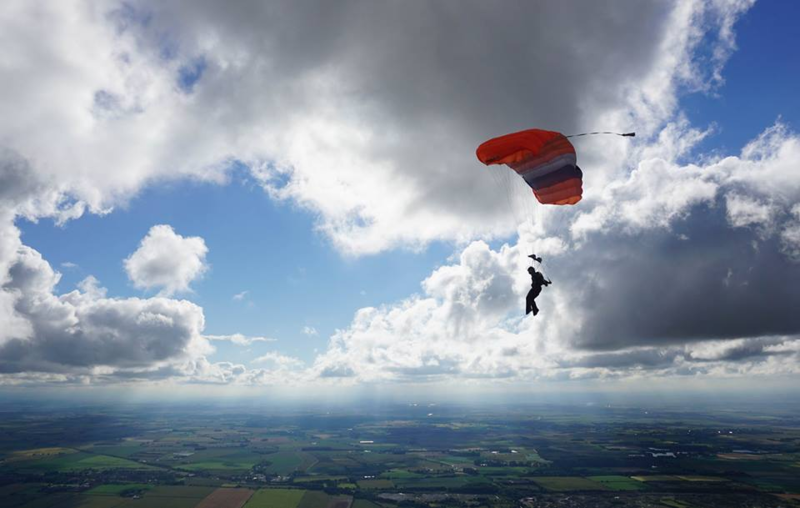 You took up skydiving four years ago when you were a fresher, what has been your highlight of your skydiving career? Every jump is a highlight! I’ve done 266 jumps so far in the UK, Spain, Portugal, Germany, Dubai, and California, with plans to continue jumping around the world. I have competed with my team at national events winning bronze and gold, and internationally at the European Skydiving League winning silver, with plans to compete again this season. I am currently the President of the Southampton Skydive club which is continuing to be a main competitor in the British Collegiate Parachute Association (BCPA) league tables, and a formation skydiving coach. Sorry, I couldn’t pick just one highlight! What would you say to someone thinking about taking up skydiving? I’ve heard many people say they would skydive but have worries about the cost, how have you found the cost of skydiving? There are two questions there: to the first question, I say if there is any part of you that is even slightly curious to give skydiving a go, just do it, and I can pretty much guarantee you will love it! With regards to the cost of the sport: I can’t deny that it is pricey, but myself and many others have managed to make it work with the limited funds we get from student loans. Your money’s got to be spent on something, right? So make some memories doing something a little bit crazy. The good thing about skydiving is that you spend money when it suits you, so there’s no pressure, but everyone finds a way to get back in the sky as soon as possible! For those of us that aren’t quite up on competitive skydiving, could you fill us in on how it is judged and the technical side of what kind of skills you must master? I compete in 4-way Formation Skydiving (FS), but there are many other competitions and disciplines out there. 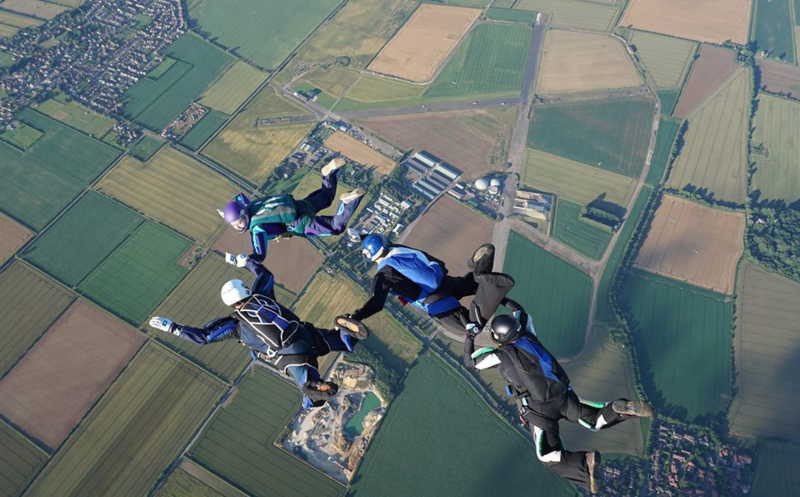 4-way FS involves four skydivers leaving the aircraft in formation, plus a cameraman who flies above them, all in a belly-to-earth position. ‘Points’ are made by the four skydivers holding on to each other, letting go, and grabbing each other again in pre-learnt and pre-set sequences of formations. The aim is to repeat the sequence of formations as many times as possible in the allotted time. The cameraman catches this on film and gives the footage to judges who add up the scores. There are four different categories: rookie, A, AA, and AAA, which is the top category. The main skills needed are being able to fly relative to other skydivers which is learnt at a very early stage of everyone’s skydiving career and then improved on over time. It takes time and effort to build trust and rhythm in a team, but it’s always worth it in the end. 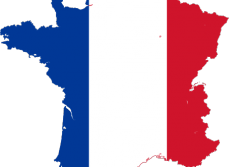 You won a silver medal at the European competition, what was that experience like? This competition was held in Germany, and half the team were different to who we had trained with all season. We were all good friends anyway, and we mainly went for the experience, so coming away with silver was an added bonus to an already exciting weekend! Meeting new people and jumping at a new dropzone was great fun. Everyone, from the UK and the other countries, were so supportive of each other which was really nice to see. We’re definitely going back next year! What’s your next goal that you are lining up in your skydiving career? The next goal will be to podium in AA this coming competition season. Looking further ahead, I think I’d probably work on becoming an instructor so I can bring brand new people into this awesome sport! Unfortunately, I’d have to say that there isn’t enough coverage, and sometimes the coverage that is there just compares women’s achievements to men’s, but it is improving thanks to campaigns such as this one at Southampton University. 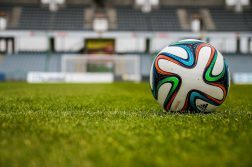 We can’t deny that there are and will always be differences between men and women, especially when it comes to sport, but that doesn’t mean that the difference is a bad thing. In all sports, everyone is rooting for their team to win, and both men and women can achieve this.